Researchers have found record levels of microplastics in Arctic sea ice and for the first time have been able to trace where those tiny plastics might be coming from. German scientists from the Alfred Wegener Institute (AWI) tested ice core samples from five regions across the Arctic Ocean. They discovered a record level of plastics, many small enough to be ingested by the microorganisms that filter the water and are often key prey for fish and other wildlife. Publishing in “Nature Communications“, the scientists report an average of 12,000 pieces of microplastic per liter of sea ice. Many of those were small fragments broken off from much larger pieces of plastic, like plastic packaging. Other culprits included paints, nylon, polyester, and cellulose acetate which is used as a base for many clothing fabrics and may be used in other manufacturing methods. The volume of plastics is around two to three times greater than previously found. This means we could have been significantly underestimating our microplastics problem, particularly in terms of sea ice and how it freezes and retains plastic. Also fascinating was that the variety and volume of plastics contained in this sample allowed the researchers to do something groundbreaking: they were able to trace the plastics back to find their probable source. 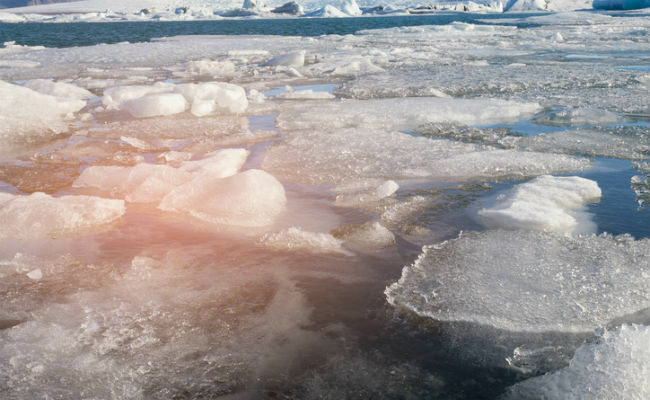 Where is Arctic Microplastic Coming From? The researchers determined that ice floes which are driven by the Canadian Basin appear to have a high concentration of polyethylene — a packaging material. Scientists in this study believe that it is highly likely this “slick” of plastics comes from the Great Pacific Garbage Patch, the largest collection of plastics on Earth that is located between California and Hawaii. To give an idea of its size, estimates suggest it’s about twice as big Texas, and thanks to our insatiable appetite for plastic, it is growing all the time. Other sources of arctic microplastics included paint particles that had flaked off from sea ships and nylon stands left in the water by fishing nets. This finding is interesting because it tells us something new: we’ve assumed that the Arctic would be spoiled by plastics from other geographic locations finding their way to the area. This is no longer true. What Does This Discovery Mean? There’s one other major facet of this study. It’s estimated that there is around five trillion tonnes of plastics floating in our oceans. Governments around the world are slowly taking steps to try to mitigate and drive down that volume of plastics with bans on microbeads and other microplastics in our health care and beauty products. Yet, the scientists in this study warn we could see more plastics released into our oceans even after we have reduced our plastics output. That’s thanks to climate change. As sea ice melts, it which will dump more plastics into our seas. This study has been called a benchmark, because it offers a much-needed glimpse not just into the plastics problem we have, but how it may be travelling in our oceans, and how we may be storing up microplastic problems for years to come. While this is sobering, it provides important insight that will allow us to target our interventions and stop our microplastics problem. Micro-plastics are an environmental issue that many people are not even aware of. Do they know what impact they will have as we consume them?